3-7-19 - Jenna will be performing her original music tonight at Charleston Beer Works, Charleston, SC from 9-12. 12.07.18 - Jenna’s new single, Cigarette, is available on iTunes, Spotify and all other music platforms. 11.25.18 - Cigarette, Jenna’s new single, will be released on Friday, December 7th. Cigarette was Produced by Mark Bryan and Engineered and Mixed by Mikey Costanzo. Cigarette and Jenna’s other original songs are available on iTunes, Spotify, Apple Music and all your favorite digital retailers. 08.06.18 - Jenna has been busy during the past several months working on a new project in Charleston, SC. Stay tuned for the release date of her new single. 11.29.16 - Mark Bryan, founding member, songwriter and the lead guitarist for the multi-platinum, Grammy Award-winning band Hootie & the Blowfish welcomed Jenna to the stage at Branded '72 in Rockville, MD on November 23rd. Jenna performed her new original song "Prisoner" in front of a festive crowd on Thanksgiving Eve. Many thanks to Mark Bryan and The Screaming Trojans for giving Jenna the opportunity to share her music. 10.21.16 - Thank you to all of Jenna's fans and fellow artists for helping her reach #1 on the Reverbnation Local charts this week. You can visit Jenna at Reverbnation.com. 10.06.16 - "Speak", the 4th track on Jenna's debut EP "Truth" is featured in the new Nadia L. King book, Jenna's Truth (published by Aulexic). Inspired by Amanda Todd’s tragic story of bullying, Jenna’s Truth is more than just a teen short story. It’s a lesson in empathy, self-awareness, and speaking out about what matters, especially bullying. Read Jenna's Truth and download "Speak" today! 07.22.16 - Jenna Feeney joined three talented local artists at The Freeman Stage in Selbyville, DE on Friday, July 15th. Jenna performed original songs from her newly released EP "Beautiful Mess" including Look Me In The Eyes, 3 AM and T-Shirt. 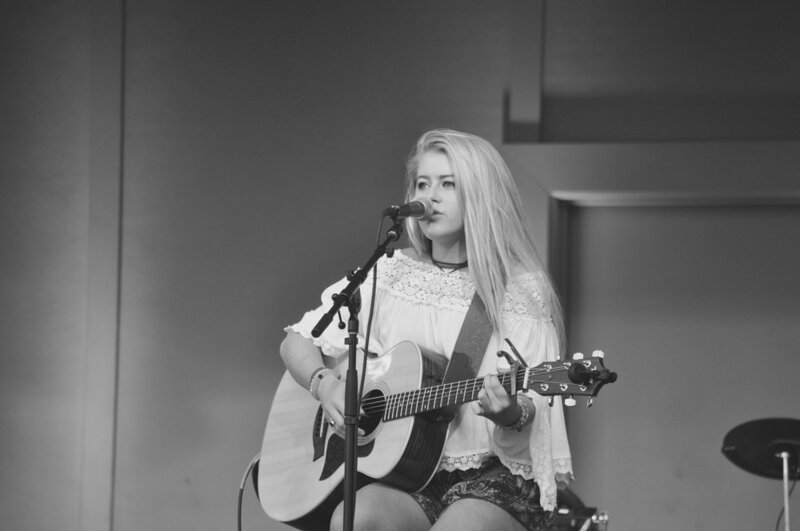 The young singer/songwriter from Rockville, MD captured the hearts of several hundred fans with her acoustic versions of Selena Gomez' hit single Kill EM With Kindness and other new original music. Jenna will be performing at Cactus Cafe on Route 54 in Selbyville, DE on Saturday, July 23rd at 6 PM and at Rocklands Farm in Poolesville, MD on Saturday, July 30th from 1-3 PM. 06.27.16 - Singer/Songwriter Jenna Feeney released her second EP “Beautiful Mess” on June 27, 2016. The 18 year old Rockville, Maryland native reunited with producers Adam B. Smith and Shannon McArthur at the Robot Factory in Nashville in March to create this high energy and exhilarating EP. Beautiful Mess is now available on iTunes, Google Play, Amazon and at other digital retailers. 02.23.15 - Jenna releases her debut EP "Truth"